A new white paper from PYA explores the growing response of the lending community to the American Land Title Association’s (ALTA) Best Practices Framework, and how lenders can benefit from working with title companies that demonstrate compliance by exhibiting ALTA Best Practices Certification. In its newest white paper, PYA details the rise of the ALTA Best Practices Framework and how it addresses issues resulting from the financial institution regulatory landscape. The paper also designates key reasons why PYA is a leading provider for ALTA Best Practices implementation, evaluation, and certification. 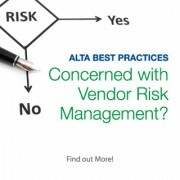 In the white paper, “Finally, A Solution for Compliance Officers Concerned with Vendor Risk Management,” PYA focuses on the benefit to lenders of working with title companies that demonstrate compliance by exhibiting ALTA Best Practices Certification. The paper provides guidance for lenders and other financial organizations as to what the ALTA Best Practices Assessment Procedures entail, as well as insight into how the Best Practices Framework is becoming an industry standard. It also helps clear up any confusion related to the types of engagements that can be performed by accounting practitioners as set forth by the American Institute of Certified Public Accountants (AICPA) in its newly issued Technical Questions and Answers (Q&A) guidance. PYA performs all four types of engagements—examinations, reviews, agreed-upon procedures, and consulting engagements—in accordance with AICPA’s Q&A guidance. PYA works with financial institutions to develop risk-based compliance strategies; to implement robust, risk-based compliance programs; to perform regulatory compliance testing services and to assist management with prioritizing internal audit focus areas through the use of an internal audit risk-assessment process.